This design was created by Jules Helleu, possibly for Charles Frederick Worth. It is based upon the alphabet, with large silver cards bearing the letters of the alphabet attached around the hem of the skirt, and letters around the sleeves. This is a good example of Victorian inventiveness in fancy dress. During the 1860s, Empress Eugenie of France threw a number of extravagant masquerade balls which required the guests to wear elaborate and inventive costumes that were made up by Worth and other Paris dressmakers. Worth, a relative newcomer, became the Empress's favoured couturier at the end of the 1850s. This made him extremely fashionable, and the rest of the ladies of Eugenie's court also bought gowns from him - and so too did their husbands' mistresses, and anyone wealthy enough to afford Worth's very high prices. 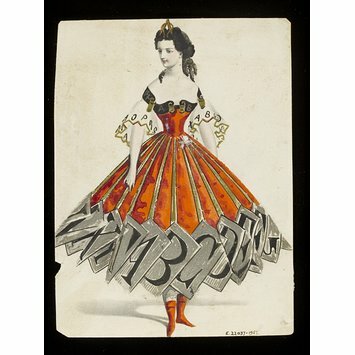 As a result, Worth was under great pressure to produce vast numbers of unique, one of a kind costumes and gowns, often at very short notice. This is one of a large number of similar designs and sketches that were given to the V&A as part of the archive and reference collection of the House of Worth, making it extremely likely that it was originally designed for a guest to wear to one of the Empress's magnificent balls. 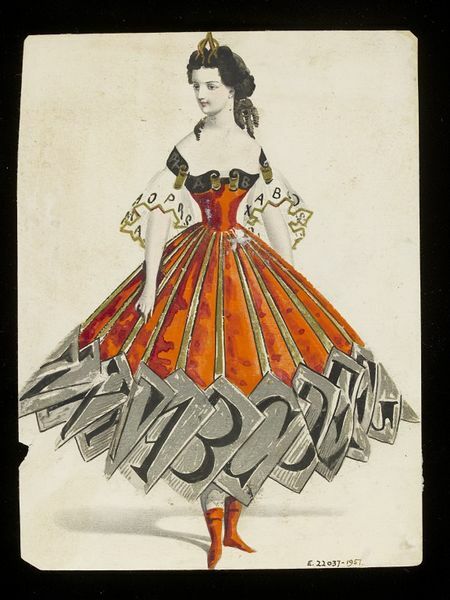 Watercolour drawing, a design for a theatrical or masquerade fancy-dress ball costume representing the alphabet. Orange and black, with silver cards. Woman's masquerade ball dress. "Alphabet". Watercolour drawing by Jules Helleu, probably for Charles Frederick Worth. Paris, 1860s.